Honda has announced that their company display at the upcoming 2013 Tokyo Auto Salon will including the new S2000 Modulo Climax, a modern concept vehicle based very closely on the same Honda S2000 that left production over three years ago – possibly hinting to the revival of the sporty rear drive Honda 2-door roadster. It is not unusual for an automaker to bring out a concept car to an auto show (especially an auto show in their home country) so it doesn’t come as a huge surprise that Honda would decide to introduce a concept car based on the popular S2000 at the 2013 Tokyo Auto Salon at the Makuhari Messe in Chiba Prefecture, Japan. What is odd about this is that the first images of the Honda S2000 Modulo Climax Concept appear to be almost identical to the old Honda S2000 – a car which went out of production in June 2009 due to extremely slow sales throughout the global markets where the sporty rear wheel drive roadster is offered. The Honda S2000 Modulo Climax Concept features the majority of the exterior styling cues from the production version of the Honda S2000 last built in 2009 with the main exceptions being a revised front end, rear end and interior which the Japanese automaker refers to as cutting-edge aeroform design and a chic interior. Up front, the S2000 Modulo Climax Concept wears a unique lower fascia that has a silver bar running across the entire front end with fog lights (or maybe driving lights) integrated into this silver bar. Around the central section of this silver bar is an opening that is larger than the central air opening on the previous production Honda S2000 with a “nose” that protrudes out further than the old production models. Out back, the Honda S2000 Modulo Climax Concept sports the same low profile molder spoiler with an integrated 3rd brake light and the same clear lens style taillights as the 2009 production S2000 but in addition to the canard-style twin spoilers mounted on the rear corners of the trunk lid, the S2000 Modulo Climax Concept gets a unique lower rear fascia with a vastly more aggressive design aided by vents on the outer corners, black cladding around the dual exhaust and a new exhaust setup. Also visible from the rear end is the new headrest molded supports that begin near the top cover and extend forward to the rear of the driver and passenger seats rather than the rollover bar design featured on the 2009 S2000 production roadster. Inside, the Honda S2000 Modulo Climax Concept benefits from a sporty interior finished heavily in leather with the mostly black layout accentuated by dark red leather bolsters in the seats while more red accenting found in the stitching on the seats and on the steering wheel finish off the interior package of this Tokyo Auto Salon concept car. 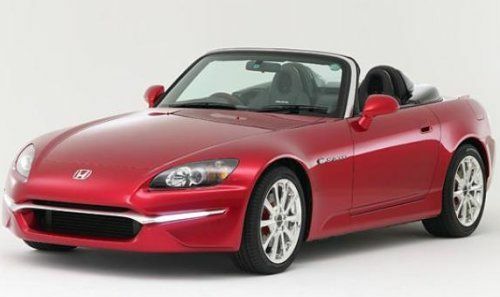 Prior to production of the Honda S2000 ending in the summer of 2009, the Japanese automaker had planned a new generation of their popular rear wheel drive roadster but the sharp economic downturn that began in 2008 caused the company to cancel plans of a new S2000. It seems incredibly odd that Honda would just decide out of the blue to design a concept car around a production model that was laid to rest almost 4 years earlier. It seems very unlikely that Honda plans to revive the S2000 with an exterior design that is nearly identical to the previous generation with the exception of a new front fascia, rear fascia and interior design. However, we are led to wonder if the Honda S2000 Modulo Climax Concept is a hint that the Japanese automaker is working on a new version of their sporty rear drive roadster. There has been an influx of new rear wheel drive sports cars to hit the global market with the most popular being the identical coupes offered by Toyota, Scion and Subaru. Considering the popularity of those models combined with the success of the Hyundai Genesis Coupe and the Big 3 American muscle cars – perhaps Honda feels that it is time to bring back a rear wheel drive sports car wearing the Honda “H”. The Honda S2000 Modulo Climax Concept will be joined by a handful of new performance models from the Mugen division and you can read more about the lineup of concept cars headed to Honda’s Tokyo display by clicking here! Click any of the thumbnails above on the right for a closer look at the Honda S2000 Modulo Climax Concept. That gallery includes an image of the 2009 Honda S2000 Ultimate Edition for reference. I hope they do bring it back. I miss my Miata and this is a step up from that car. This car looks just like I remember it, good and bad. The car is still crying out for a better toneau cover and better in-dash infotainment. 240 HP and a six speed, rear drive car. Sweet.